Procession leaves Avenue Road for Eyes Meadow via Hazelwood Road, King Street,Town Street and Cockpit Lane. Procession arrives on Eyes Meadow and parades round the Arena. 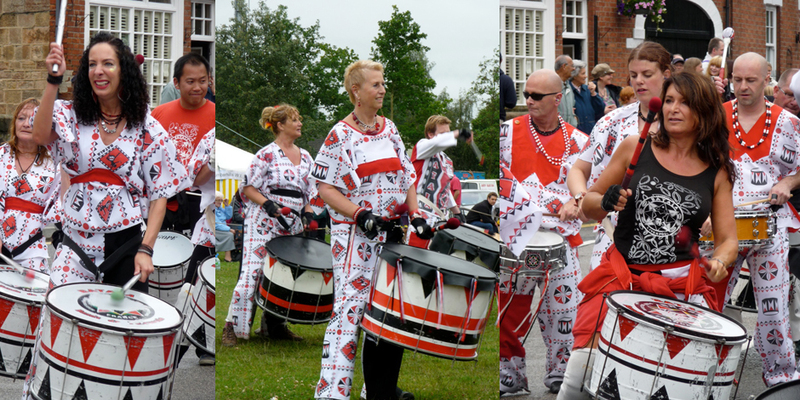 Activities for CARNIVAL 2019 are being planned…… watch this space! 12:45 Carnival Procession processes through the village! No Carnival would be complete without a burger or two and Gerard Varin ensures our Hog roast and BBQ are a roaring success. Setting the pig in motion in the early hours for your enjoyment, and run by volunteers throughout the day – every burger you eat directly benefits the village. There will also be Artisan Crepes, Toasties, Ice Cream and snacks throughout the afternoon. Later in the day there will be pizzas and curries …. In large marquee, sponsored by DBS (Duffield Building Services Ltd), Duffield Cricket Club are again manning our licenced bar, organised by Ryan from The Kings Head, incorporating White Peak Distillery Gin Bar, with the proceeds being split between Duffield Carnival and the Cricket Club so it’s worth having that extra pint! Take a look at the Arts and Crafts on display in the other end of the marquee, whilst sampling afternoon tea provided by Cumberhills WI…. Buy your tickets in advance of Carnival Day and pay £2.50, from DUFFIELD NEWS, PATTENMAKERS ARMS, MEADOW VALE STORE, TOWN STREET FISH BAR and THE TOWN ST TAP. Ticket sales pay for our costs e.g. marquees, acts, toilets etc. Without these sales we could not stage the Carnival.